Help Friends to Honor and Preserve the National Memory of World War II and to Create the Next "Greatest Generation" of Tomorrow! During World War II, America's sons and daughters, friends and neighbors – 16 million strong – fought on the battlefront to preserve freedom and civilization itself. At home, the entire nation united in a common purpose to support the troops and win the war. When peace came, more than 400,000 Americans had sacrificed their lives. Unity, integrity, duty, humility, courage, and sacrifice – this is the legacy of World War II and the "Greatest Generation." Unfortunately, today our country and our citizens have lost their way. They have forgotten the hard-fought lessons of our WWII generation. Every day we are inundated with messages and images of discord, dishonesty, and selfishness. 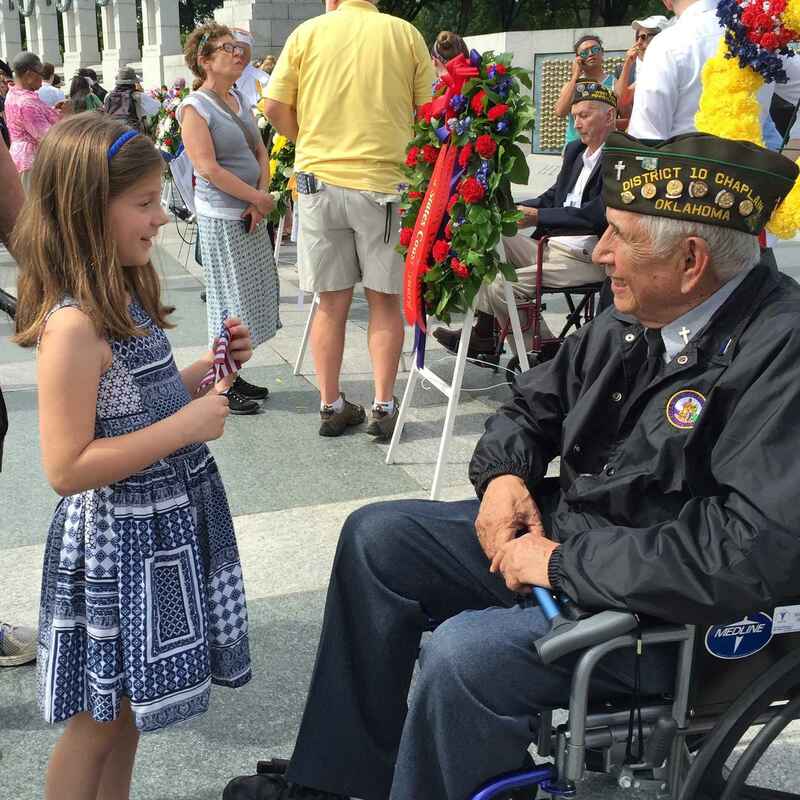 leading the effort to add FDR's D-Day Prayer, one of the largest mass prayers in history, to the WWII Memorial and to provide a contemplative space to remember the more than 400,00 American souls lost during WWII; and much more. Please help us keep the legacy of World War II and our Greatest Generation alive in the hearts and minds of our current and future generations and to create the next Greatest Generation of tomorrow! Friends is a registered 501(c)(3) charity. Tax ID: 13-4358477. In honor of those who served and sacrificed their lives for our freedom. Fortunately my dad made it home to a wife who together had 8 children. We thank all those who fought for the United States in World War II. The Memorial means that we will never forget! My donation honours my Mother and Father who served during the Second War. My Mother served in the British Army, while my Father in the US Army. In memory of a great soldier and father, Marlyn Lee Reisinger. This donation is in the honor of Edward Skehan from Newington, CT. This is to honor and celebrate this World War II veteran’s 101st birthday. In honor of my late Grandfather Jesus Lopez on his birthday. In honor of Norman Duncan’s 100th birthday! In Memory of Howard Price, Jr. In memory of Vincent "Jim" Vaccaro, U.S. Army serving in WWII for the 163rd Combat Engineers. In honor of my dad, Ray Wissel, who served as a minesweeper in Italy with the 88th Inf. Div, 350th Regiment. He earned a Bronze Star and Purple Heart.